The Congressional Research Service (CRS) isn’t as well known in these parts as the CBO, but their reports are widely considered equally reliable and nonpartisan. –it provides before- and after-tax analysis. …both years were at approximately similar points of the business-cycle with moderate inflation (about 3%), a modest unemployment rate (about 5%), and moderate economic growth (3.7% in 1996 and 2.7% in 2006). Second, 2006 was the year before the August 2007 liquidity crunch and the onset of the severe 2007-2009 recession. Third, there were major tax policy changes between these two years. Fourth, both 1996 and 2006 were three years after the enactment of tax legislation that affected tax rates and are unlikely to be affected by short-run behavioral responses to these changes. –The table and figure show the classic inequality pattern of increasing income growth as a function of income (after-tax income, in this case). 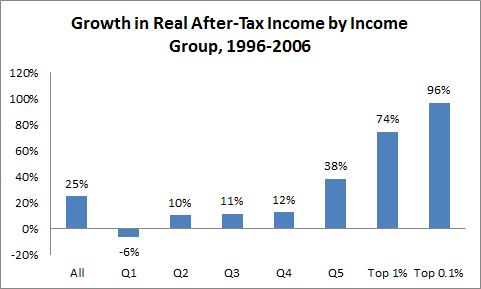 Real GDP per capita grew at about the same rate as the overall average of after-tax income over these years…25%. But low-income families lost ground, middle-incomes grew slowly, less than half the pace as the overall average, and the top soared ahead. Income for those at the very top of the income scale—the top tenth of the top 1% (the top 0.1%; avg 2006 income: $5.7 mil) just about doubled. Source: CRS, see link above. Dollar values in table provided by CRS. –Like the earlier CBO report, the CRS also finds that the tax system grew less effective at reducing income inequality over this period, i.e., it become less progressive. 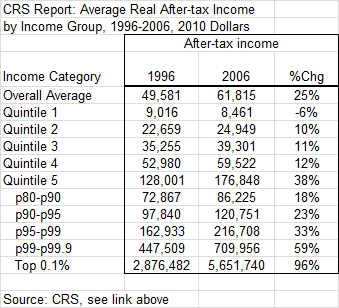 –For example, the CRS data reveal that while the effective tax rate (federal taxes paid as a share of income) fell on average from about 23% to 20%, it fell much more than that for those in top 0.1%: from about 33% to 25%. Had the top share faced their 1996 effective rate in 2006, their tax liability would have been $600,000 higher. –the share of income from dividends and capital gains grew from 10% to 14% among all tax filers and from 31% to 38% among the top 1%; since this type of income is much more concentrated at the top to begin with, its increasing share is one explanation for inequality’s growth. –the wage and salary share, on the other hand, fell sharply, and this too boosted inequality, since its distribution is much less skewed than capital incomes (though it too became more unequal over this period). –in fact, if capital and business income shares hadn’t grown—i.e., if one assigns the growth in their shares to the wage share—inequality would have grown slightly more than half as fast as it did. I think a lot of people sense that there’s something unsettling about this shift from labor income to capital incomes. It seems endemic of a society that devalues work while providing outsized rewards for speculation and asset accumulation. The CRS findings place that sensibility in the context of hard data. Share the post "Another Excellent Inequality Study"
4 comments in reply to "Another Excellent Inequality Study"
What is “after tax income”? Which taxes (Federal, State, FICA, property, sales, capital gains, estate) are subtracted from gross income? All fed taxes–income (including wages, cap gains, dividends), payroll, corp, estate, not property (it’s local). So true after tax income for lower income brackets will be even lower– since sales tax, especially, is paid on almost their entire income. Which is a long way of saying– the income inequality is probably higher than this study shows. For those of us whose income comes completely from labor, it feels like the system has been gamed to decrease labor compensation and increase capital compensation. Wages have stagnated or decreased because of competition from low-wage nations with unfairly supported currencies. Also, because automation has removed many employees who formerly held high-compensation jobs. Meanwhile, the owners (http://www.youtube.com/watch?v=9dY4WlxO6i0) have seen their income increase because of ROE-like of metrics of performance. And, the oft-cited ratio of CEO-to-employee pay. Tax policy has also swung dramatically to favor the owners whose rates on earned income, capital gains, and inheritance have declined significantly. So, now, what do we do about it? If the Clinton-era tax brackets were replaced, would everything be hunky dory? Is that even possible? If not, what other policies are you proposing? I’m with you on “fixing schools” and more enthusiastic than you seem to be about building infrastructure. In the end, though, those are general economic stimulants. What specifically to address income inequities? Tariffs on goods produced in countries with suppressed wages and artificially exchanged currencies? Taxation policies on compensation for C-levels that helps pull them back into more rational multiples of the rest of the employees? Requirements for all employers to have some sort of ESOP component to gradually transfer ownership to the employees?